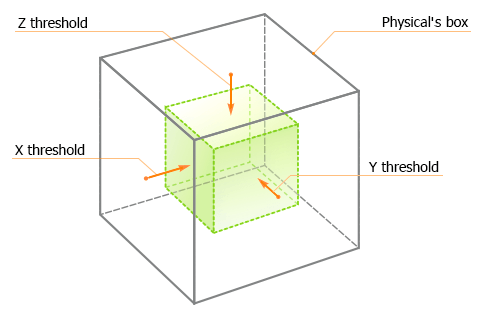 A physical noise is a cuboid shaped area that adds a distribution flow based on a volumetric noise texture. 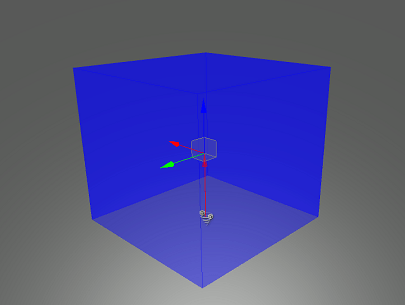 The physical noise enables to simulate a force field that affects particles and physical bodies with a spatial 3D noise. Noise is enabled. 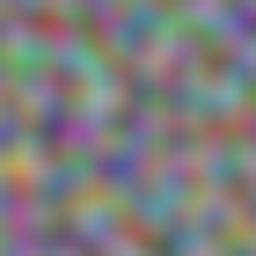 A colored square is a noise image texture. The physical noise will affect particles only if their physical mass is nonzero. The physical mass for the particles can be set on the Particles tab of the Parameters panel. The calculations described below are added for better understanding of the physical noise parameters. The direction of the force, which affects particles and physical bodies inside the physical noise box, is stored in the noise texture: a 3D texture, each texel of which stores force direction. 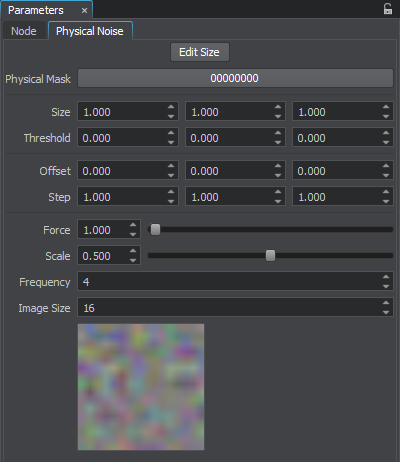 The noise texture that is used for the physical noise can be adjusted via UnigineEditor. force The resulting force that affects the physical body at the current point. force_direction Direction of the force vector that is stored in the color of a texel of the noise texture. threshold Threshold distance along the axes. 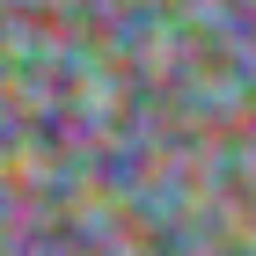 pixel_color Color of the noise texture pixel that stores direction of the force vector. 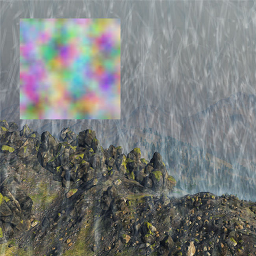 pixel_coordinates Coordinates of the noise texture pixel that stores direction of the force vector. body_position Local coordinates of the physical body (relative to coordinates of the physical noise node). On the Menu bar, click Create -> Effect -> Physical Noise. Click somewhere in the world to place the physical noise. 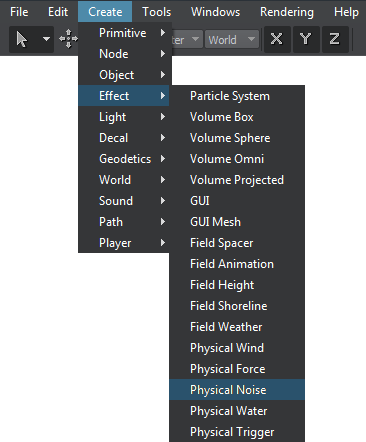 The new physical noise node will be added to UnigineEditor and you will be able to edit it via the Parameters window. On the Physical Noise tab of the Parameters panel, you can adjust parameters of the physical noise. To better understand how the following parameters affect the resulting force inside the physical noise node, see the chapter on Main Concepts. Toggles the editing mode for the physical noise node. 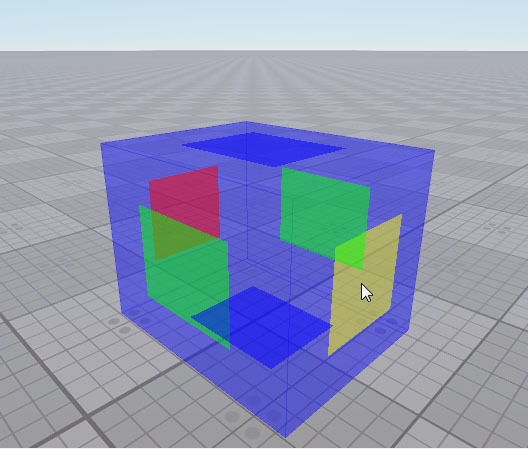 When enabled, the physical noise box sides that can be resized are highlighted with the colored rectangles. To change the size of a side, drag the corresponding rectangle. Physical mask. The physical mask of the physical noise must match the physical mask of the physical object. Otherwise, the physical noise won't affect the object. Size of the physical noise box along the axes in units. Threshold distance along the axes. The threshold determines the distance of gradual change from zero to full force value. This values are relative to the size of the physical noise box. It means that the threshold values should be less than the size of the physical noise box. The following parameters are used for pixel sampling from the generated noise texture. You can animate a force field in run-time by changing these parameters. Sampling offset along the axes. Size of the sampling step along the axes. 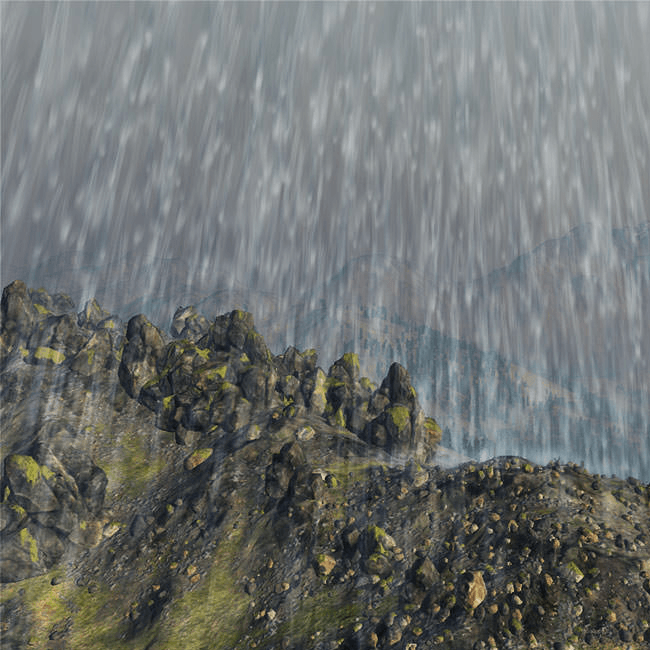 It is not recommended to change values of the following parameters in run-time as the noise texture will be regenerated and the performance will decrease. Number of octaves for the Perlin noise. The higher the value is, the more details the noise texture has. The minimum value is 0, the maximum value is 16. Size of the noise texture image in pixels.